Arranged by Steve Reed Tourism Ltd of Hampshire in conjunction with the Wye Valley and Forest of Dean Tourism Association the three day event took in a fascinating array of attractions, venues and scenic tours of this Area of Outstanding Natural Beauty [AONB]. 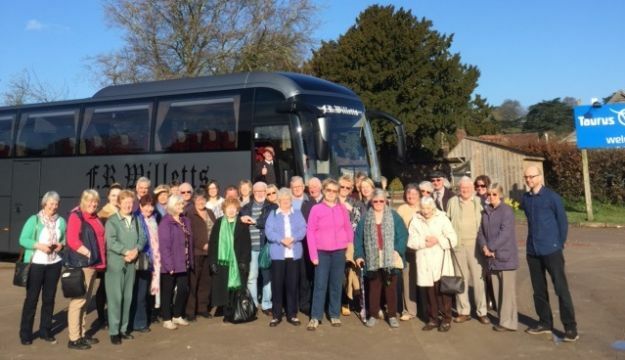 Forty coach and tour operators and group travel organisers were based at the Bells Hotel in Coleford and enjoyed familiarisation visits courtesy of local attractions – with local coach operators Paul Willett Coaches providing the transport for the VIP guests. Led by local tourist guide Val Long, the group commenced their visits to the Forest of Dean and Wye Valley with a journey on the Dean Forest Railway and on board the Perrygrove Railway where they were greeted with glasses of bubbly during their trip. Visits to the Wyndcliffe Sculpture Park at Chepstow; Harts Barn Cookery School; Hillside Brewery and Puzzlewood in Coleford preceded dinner at the St Pierre Marriott Hotel in Chepstow. Taurus Crafts in Lydney, the Dean Heritage Centre and the Forest Hills Golf Club concluded the event for the buyers who also enjoyed a special ‘meet the tourism industry’ workshop there when they were able to talk business face to face with the local tourism providers. And some of the group experienced the Forest of Dean and Wye Valley’s famous outdoor activities with a taster abseiling session. ‘We very pleased to see such a massive response from the travel trade for this first ever group showcase for our area. This would not have been possible without the great support we have received from our partners. ‘Now the scene has been set for what we hope will be new generations’ of coach passengers and groups of all types coming into our beautiful part of the world,’ explains Maureen.